This week we visited Aberdare Town Centre to look at access issues for people with disabilities. Amongst those issues is the problem of parking over dropped kerbs. 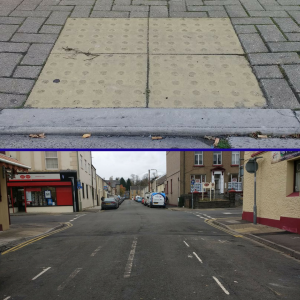 Dropped kerbs make a safer journey for all, from those in wheelchairs to parents with prams. Help us to make a more accessible Wales! There are three main examples of dropped kerbs; the first one is what we would call accessible dropped kerbs. When correctly installed they can form part of a cohesive crossing system. These dropped kerbs usually come in pairs at opposite sides of the road. When accompanied by tactile flooring, as in the image below, they offer people with disabilities safe opportunities to cross. Obstructing these dropped kerbs puts lives in danger. 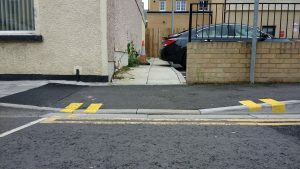 Another example of dropped kerbs are the everyday access dropped kerbs that can often be found on entries to garages, driveways or walkways. It is important to remember that even if there are no signs in place, such as H bar markings or double yellow lines, it is still illegal to obstruct these dropped kerbs. 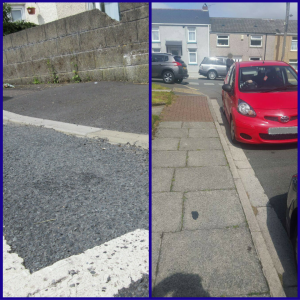 As well as the legal repercussions, obstructing these dropped kerbs can cause great difficulty for people with disabilities, parents with pushchairs and the elderly. The last type of dropped kerb we are looking at, and the one we are finding the most problems with, is the individual personal dropped kerbs. These are installed by local authorities for residents who have specific access needs. They sometimes have tactile flooring and are often marked with a white ‘H-bar’ marking. 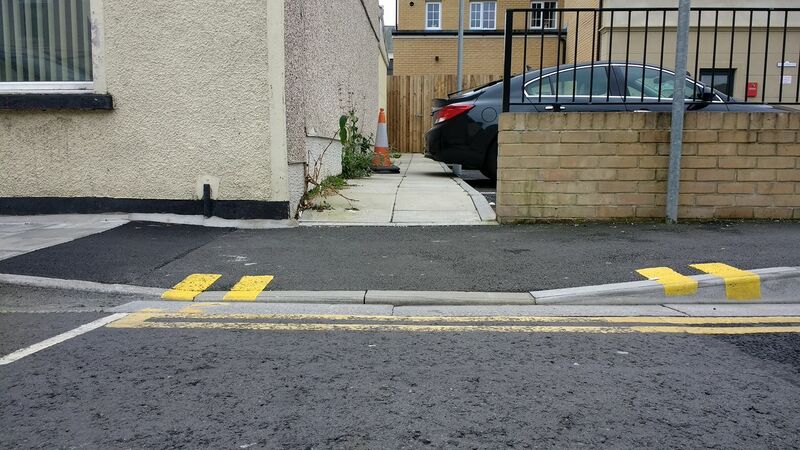 These dropped kerbs offer residents with specific access needs easy access to their property. Parking in front of them can result in a fine of £70. Keep your eyes peeled over the next few weeks as we prepare to launch our Considerate Parking Campaign.